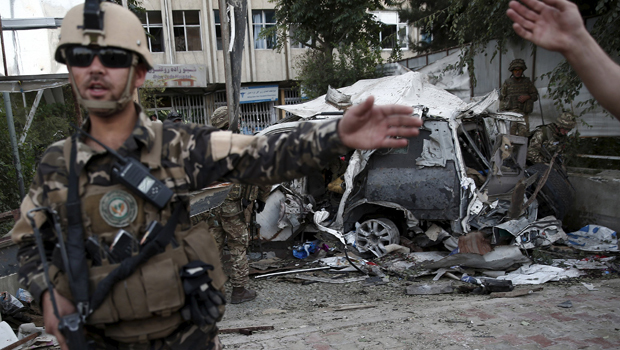 KABUL, Afghanistan -- A suicide car bomber attacked a NATO convoy traveling through a crowded neighborhood in Afghanistan's capital Saturday, killing at least 12 people, including three American civilian contractors for the international military force, authorities said. The attack struck near the private Shinozada hospital, the sound of the powerful blast roaring throughout the capital. Ambulances and Afghan security forces quickly surrounded the blast site, blocking access off from about half a mile away. U.S. Embassy spokeswoman Monica Cummings told CBS News' Ahmad Mukhtar that the blast was about a mile away from the embassy.